BLOOMFIELD HILLS, MI.- Customized Smart Cars with graphics created by Elliott Earls, Cranbrook Academy of Art’s Artist-in-Residence will be zooming around the streets of Miami during the celebrated art fair ArtBasel/Miami from December 4-7, 2008. Earl’s will also perform a piece inspired by the Thoughts on Democracy exhibit at the Wolfsonian Museum on Friday, December 5. 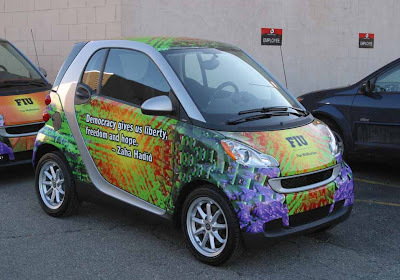 Eight Smart Cars each customized with a quote about democracy from a renowned artist or designer will be driving around Miami Beach Art Basel Miami Beach one of the most important art events. Art Basel Miami Beach combines an international selection of top galleries with an programs of special exhibitions, parties and crossover events featuring music, film, architecture and design. Exhibition sites are located in the city's beautiful Art Deco District, within walking distance of the beach and many hotels. Earls work is also on display in the Wolfsonian Museum ’s Thoughts on Democracy exhibition which is comprised of posters created by 60 leading contemporary artists and designers, invited by The Wolfsonian to create a new graphic design inspired by American illustrator Norman Rockwell’s “Four Freedoms” posters of 1943, which were recently gifted to the museum by Leonard A. Lauder. The exhibition is on view and free to the public in the The Wolfsonian Museum's lobby through December 2008. As part of the exhibition and his work currently on display at the Museum, “Liberty Weeps,” Earls has created a performance piece which will debut on Friday, December 5. Earls is the Artist-in-Residence and Head of the 2D Design Department at Cranbrook Academy of Art where he received his MFA in 1993. Earls's is best known for his experimentation with nonlinear digital video, spoken word poetry, music composition and design. His commercial clients have included Elektra Entertainment, Nonesuch Records, Scribner Publishing C., Elemond Casabella (Itlay), The Cartoon Network (U.K.), Imaginary Forces, Polygram Classics and Jazz, The Voyager Company and Janus Films. His commercial work includes two television commercials for the Cartoon Network in the United Kingdom as well as an interactive documentary on the work of Frank Gehry for Casabella in Italy. As a typographer, his original type design is distributed worldwide by Emigre Inc. Earls's posters entitled "The Conversion of Saint Paul", "throwing Apples at the Sun,""The Temptation of Saint Wolfgang" and "She a Capulet" are part of the permanent collection of the Cooper-Hewitt National Design Museum, Smithsonian Institution. Earls's latest enhanced CD/poster package was recently added to the Cooper-Hewitt's research file.Elliott has performed at the Cretiel Theatre Festival in France, The Walker Art Center, Minneapolis, Minesota; The Oak Street Theatre in Portland, Maine; at Experimenta 99, Lisbon, Portugal; Opera Totale in Metrre/Venice; Typo 2000 in Berlin; and Living Surfaces in Park City Utah.